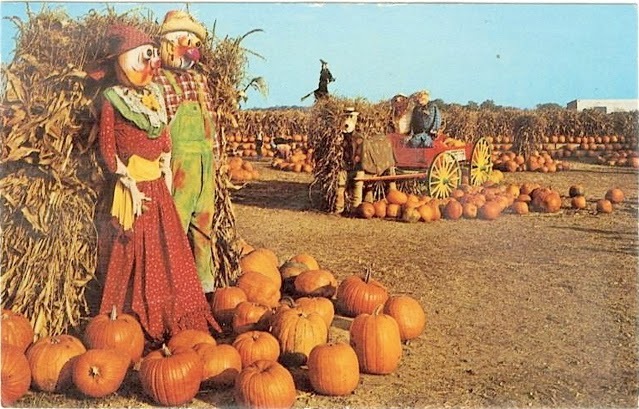 In one of my old photo albums, there is a picture of me--I must have been around my daughter's age--standing, in the hazy fog from an old flash camera at night, on a wagon at Tice's Farm in northern New Jersey, surrounded by cornstalks and scarecrows with pumpkin heads. I am grinning ear to ear in my pink jacket with the fluffy wool hood, and my hands are shoved into my pockets. Most likely, I'm thinking about apples, and apple cider, and cider doughnuts. I used to think that my obsession for locally-sourced food and farm markets grew out of my time in LA, when I would follow the markets from one neighborhood to the next to escape from life in graduate school, hearkening back to some less-complicated agrarian past that I never lived. But now I think that those roots are much deeper: that it was about how we spent weekends in the fall, and long days in the summer, and about where half of me comes from. I'm a child of a parent whose own childhood revolved around the harvest. My father grew up in a poor farming family in rural Spain until he was old enough to go to a Marist boarding school where he studied to join the religious order. Sometimes, when he was feeling generous, or wanted us to demonstrate more entrepreneurial spirit of our own, he would recount days of doing errands, bringing lunches to workers in the field and earning a few coins here and there that he kept wrapped in a handkerchief. Maybe it was this childhood that drew him into the garden during the summer, with his bat-sized zucchinis and bowling-ball kohlrabis, and into the orchards in the fall, leading caravans of his urban high school students into the orchard in lowriders that they'd park under the low-hanging fruit. Maybe it was what drew him to Tice's and Van Riper's farms, with their garish Halloween displays and annual Thanksgiving Turkey Shoot. While I liked gardening in our small plot behind the house with my father, I loved apple picking, and going to those farms, getting lost in the cornstalks, dragging my feet through the tufts of hay, picking pumpkins in the field. Later, as the farm grew more commercial, we'd watch them press cider through the tall windows, and then turning the corner to watch rows of doughnuts float down the lake of oil where they were fried, and across like a small flotilla to the drydock, where workers loaded them into bags, dusting them liberally with sugar. If I were lucky, I'd get to eat a candy apple, sometimes coated in coconut, everything sticking to my teeth. When I was six, there was a fire at Van Riper's that destroyed the cider mill and packing room, and I cried, wondering if we'd ever be able to go back. I was disappointed to learn that Van Riper's became an A&P shortly before I graduated college, and that Tice's turned into an upscale mall six years later, complete with Banana Republic, bluemercury, and J.Crew, bearing no resemblance to the farm of my youth. I happened across their page online the other day and found them advertising a fall harvest festival that promised to "keep the spirit of the Tice Farm alive." Somehow, I just don't think it would be the same. What parts of your past define you in ways that you sometimes forget? Our new coffee shop started selling a cake like this recently, and I was inspired to find a recipe I could try on my own. This is a pretty close approximation of those fresh hot doughnuts from my childhood, especially with the sugar cinnamon coating that gives it an extra crunch. Adjust a rack to the center of your oven and preheat to 350F. Grease a Bundt pan with 1 T. butter. In medium saucepan, bring chopped apple and cider to boil over medium-high heat. Reduce heat to medium and simmer until most of the cider has been absorbed and apples are easily smashed with a fork, 10 to 12 minutes. Remove pan from heat, cool 5 minutes, then pulse in food processor until pureed. Measure out 1 cup apple mixture and stir in milk; set aside. In medium bowl, whisk together flour, baking powder, baking soda, salt, nutmeg, and allspice; set aside. In large bowl, beat remaining 8 T. butter, sugar, and brown sugar on medium speed until light and fluffy, about 3 minutes. Add eggs, one at a time, beating well after each addition. Add oil and beat until incorporated, about 1 minute. Decrease mixer speed to low and add flour mixture in three batches, alternating with apple mixture, scraping down sides and bottom of bowl with rubber spatula as needed. Increase speed to medium and beat mixture just until combined, about 20 seconds. Add vanilla and beat once more, just to combine, about 10 seconds. Scrape batter into prepared pan. Bake until cake tester inserted in cake comes out clean, rotating cake halfway through baking, 35 to 45 minutes. Transfer cake to cooling rack set inside baking sheet and cool in pan 10 minutes, then invert directly onto cooling rack. Combine sugar, cinnamon, nutmeg, and salt in small bowl. 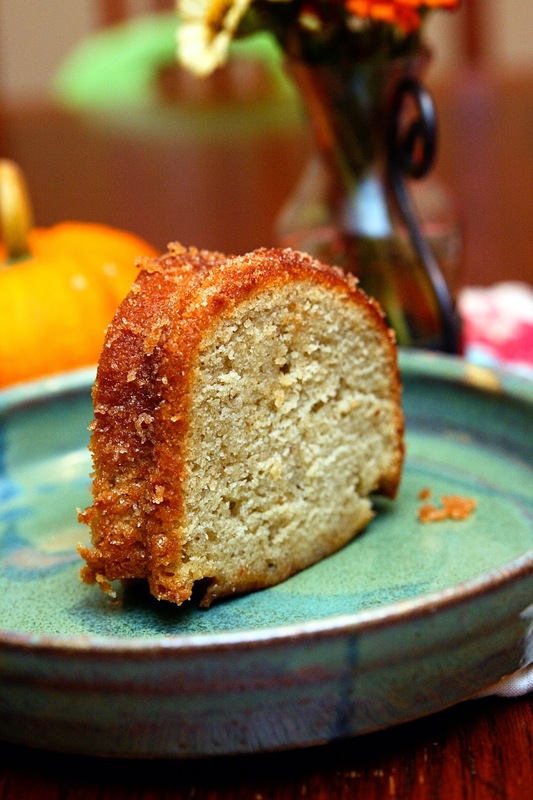 Sprinkle warm cake with cinnamon sugar, using fingers to rub it onto sides. I too have vivid memories of Van Riper's and Tice's. I grew up within biking distance of both. The hot doughnuts and cider, and the extravagant Halloween decorations, are vivid and integral memories from my childhood. The only survivor of the great Bergen County farms is Demarest's, but it barely resembles the farmstand of my childhood where Grandma bought local corn and peaches. Thank you for this beautiful post. My mouth is watering at the photo & recipe of that cake! !